As you can imagine, this show is purely for fun with no relationship with the original anime that are featured in the show. But that being said to really appreciate Isekai Quartet to the fullest you’ll want to have seen the anime that they’re referencing! Fear not, for I have these listed (and reviewed) already for your viewing pleasure! 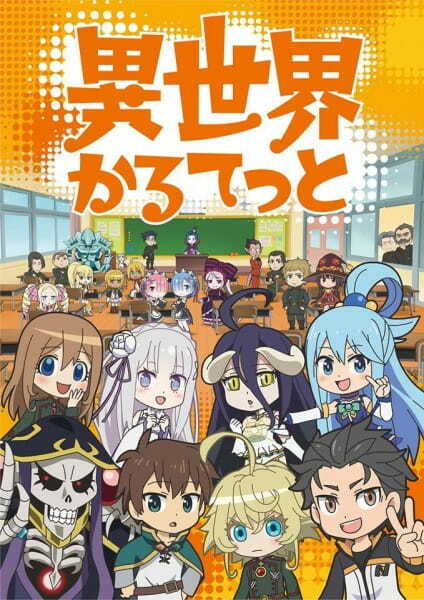 So after you get through all of that let’s dive into Isekai Quartet! So as you can imagine, without any connection to the plot of the originals, the number of shenanigans that will happen throughout the course of the show is apparent, just within the first few minutes. Both an easy watch and with only 12-minute episodes what else could you ask for? Also it’ll be fun to see how the different character interacts with each other. Though, as I mentioned before, it’s best to watch this show after gone through the original anime that are being featured here.